The brain trick that can make you rich.. I had a shocking conversation with my former partner on the Dayton Police Department. We spent a day together talking about old times. He recounted story after crazy story. Of which there were many. But… when he recounted some of the traumatic ones, I could only recall one. It was as if he was sharing stories about someone else. I know I was there. Heck, the records written by ME show I was there. But it’s as if the details got wiped clean from my memory banks. My partner told me everything in detail. And I just looked at him with a blank stare. I had zero memories of those situations. Some shrink would love to sink their hooks into me, draw out those memories and help me “deal” with them. With years of therapy at $200 an hour. No thanks. My brain already discovered how to deal with it. And I REALLY like its solution. You see, clinical psychologists have proven that people often alter their memories of the past to make them fit their perceptions. As you’ll soon see, it is THE secret to the massive success you desire. But make no mistake about it. We’re venturing into unexplored expanses where lesser mortal marketers fear to tread. And you’ve NEVER heard this stuff from any of the lesser mortal marketing gurus. However, if you know what to do with it you can experience INSANELY high conversions with your sales copy. And bank accounts filled to overflowing. What I’m revealing is THE secret of the most successful A-list copywriters, marketers and masters of persuasion. 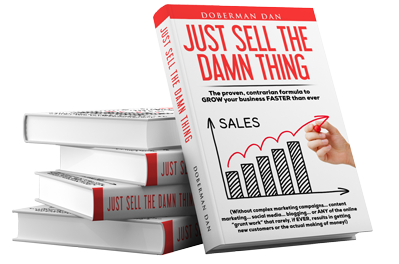 If you want EXPONENTIALLY better results from all your sales funnels, this is a game changer. I’m revealing everything in the June issue of The Doberman Dan Letter. It’s being prepared right this minute as we speak. And will be mailed to the knights in my Marketing Camelot on Thursday. You’re about to discover a secret. One that can turn you from a so-so marketer and copywriter… to a frickin’ ROCKSTAR. Prepare yourself. You’re about to embark upon a journey that will change the way you look at your reality — and your fellow human beings — forever. Click here before you miss out on this breakthrough new issue of The Doberman Dan Letter. Previous post: Ready for a total mind f*#k?